﻿ Chicago Hispanic Newspaper, Lawndale News, Hispanic Bilingual Newspapers, Su Noticiero Bilingue » Thank You Mr. Chavez? April 24, 2019 4:50 am You are here:Home Commentary Thank You Mr. Chavez? Posted by Editor on March 10, 2016 in Commentary | Comments Off on Thank You Mr. Chavez? 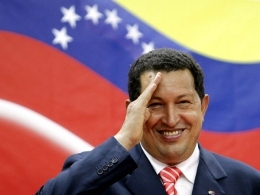 On the third anniversary of the death of former Venezuelan President Hugo Chavez (March 5th), current Venezuelan President Nicolas Maduro has launched a ten day celebration of Chavez’s life and “contributions” to Venezuela. Among those heads of state who have gone to visit Venezuela for the anniversary were Bolivian President Evo Morales, Nicaraguan President Daniel Ortega, and Salvadoran President Salvador Sanchez Ceren. Celebrations were held by the followers of Hugo Chavez all over Venezuela, and these celebrations included Chavez’s historic coup attempt in 1992 and his early years as president of the country. Of course, I have to ask myself what exactly did he do for Venezuela and the Venezuelan people that should be celebrated? He wiped out all of the democratic institutions that insured an independent judiciary, allowed freedom of speech and peaceful assembly, and the independent news media. Chavez had created a largely sham court system, a sham national congress, and a constitution that gave him almost unlimited power including the “right” to be “elected” as many times as possible. Chavez had confiscated private property for his own government’s benefit and left former home and property owners high and dry—–no compensation. Opposition leaders were attacked, imprisoned and even killed under Chavez, and tens of thousands of Venezuelans have fled the country. To top it all off, ordinary Venezuelans are having it worse now than before Hugo Chavez came to power. There are shortages of basic foods, consumer goods, and social services have been largely curtailed. Crime is rampant, and the homicide rate in the country is 45 per 100,000 people (to put this in perspective, the homicide rate in the United States is 4 per 100,000 people). As if these woes are not bad enough, Venezuela now suffers from the highest inflation rate in the world at 180 percent (because of this, the Venezuelan government has started to print larger denomination bills so people can tell which bill is which). So even if, say, bread, beans and milk are available, many Venezuelans would have a hard time affording them. The only bright spot in the whole thing is that the majority of Venezuelans, even in the past election heavily rigged in favor of the government, voted overwhelmingly for the opposition to Maduro’s government. We have yet to see if this new opposition congress will be able to get rid of Maduro and the ruling United Socialist Party of Venezuela in order to dismantle the “socialist” order that now runs the country. With all of the problems Venezuela has, the only two things we have to thank Hugo Chavez for is that he did not bring the country to total collapse, and could not entirely wipe out all opposition to him. Beyond that, there is nothing to thank him for.